Wow you all this year has just flown by. They say the older you get the faster time seems to move, if thats the case I am old as dirt. Really old dirt. It also means we all better be working on our christmas shopping. And Zoya is helping to make the holiday shopping a little easier this year. They have put together loads of prepackaged holifay gift sets, with everything from nail polish, to lipstick, to nail care, to lip gloss. If you can’t find something for some of the ladies on your list in here, well then you may as well just pick up a giftcard for them. No doubt we all have someone on our list that is truly impossible to shop for! (I’m looking at you mom) Let’s go ahead and take a look at a few of these. I have opted to go over the info of each of these gift sets rather than swatch them. One because these are all previously released items and plenty of swatches can be found, and perhaps the best reason is that I’m looking to do a few giveaways with them in the coming weeks. Keep your eyes open for those! Quad Set Includes four full size bottles of Zoya Nail Polish in Shimmer, Mia, Madeline and Joni. Quad Set Includes four full size bottles of Zoya Nail Polish in Ellie, Mandy, Carmen and Marigold. Quad Set Includes four full size bottles of Zoya Nail Polish in Vanessa, Ash, Sam and Jem. Quad Set Includes four full size bottles of Zoya Nail Polish in Dream, Ryan, Payton and Lael. Naked ManicureTM Women’s Travel Kit is an easy, all-in-one, fun-size (0.25oz) retail kit. Includes one bottle of Naked Base, Pink Perfector, Lavender Perfector and Glossy Seal Topcoat. Quad Set Includes four full size lipgloss of Zoya Hot Lips in Fame, Flirt, Purr and Marachino. 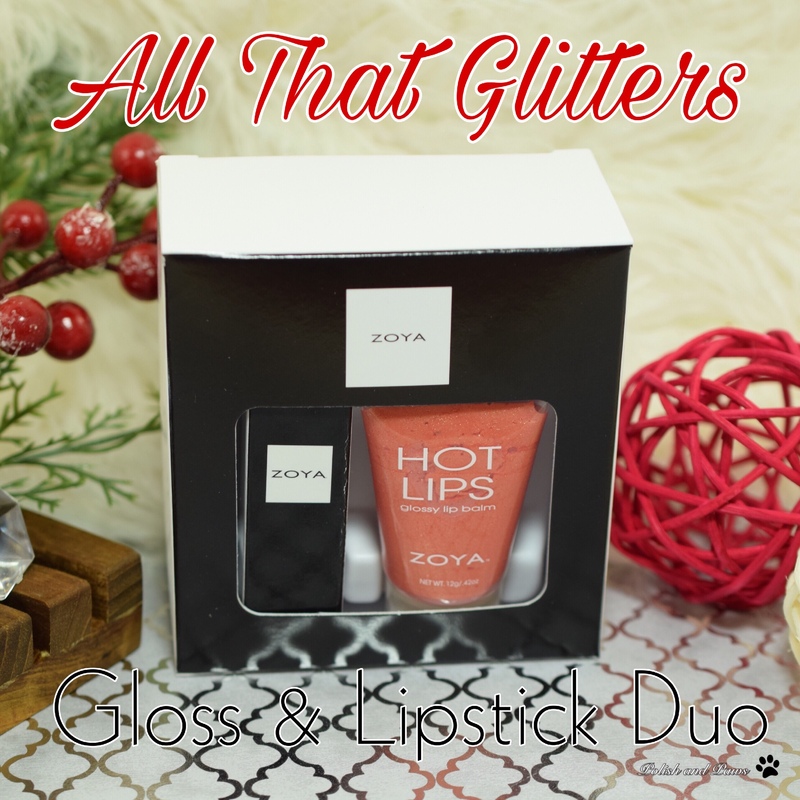 All That Glitters Duo includes a full-sized Zoya Hot Lips in Blog and one Lucky Lipstick. Packaged in a stylish black window box. Holly Days Duo includes a full-sized Zoya Hot Lips in Entourage and one Matte Velvet Red Lipstick. Packaged in a stylish black window box. Fun & Frosty Duo includes a full-sized Zoya Hot Lips in Anonymous and one Candace Lipstick. Packaged in a stylish black window box. Snow Kissed Duo includes a full-sized Zoya Hot Lips in Luck and one Addie Lipstick. Packaged in a stylish black window box. Believe in Magic Duo includes a full-sized Zoya Hot Lips in Hocus Pocus and one Paisley Lipstick. Packaged in a stylish black window box. Taste Of Winter Duo includes a full-sized Zoya Hot Lips in Starlet and one Bristol Lipstick. Packaged in a stylish black window box. 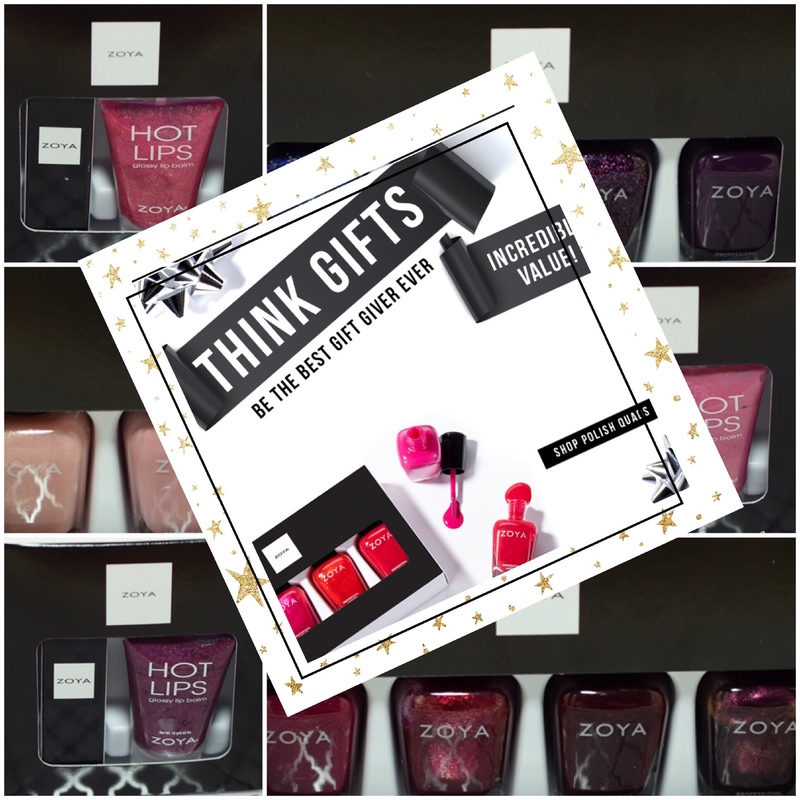 All of these, as well as plenty more gift sets, are available on HERE on Zoya.com. These are fantastic gift options for the ladies on your shopping list, and have a great price as well!